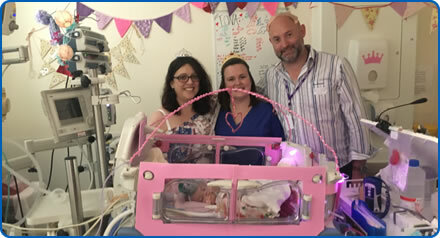 Nurses transformed a room in the Neonatal Intensive Care Unit (NICU) at Southmead Hospital into a princess’ palace for a baby in their care. 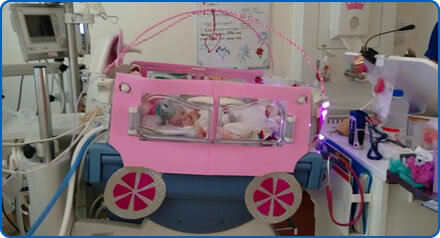 One nurse – Hannah – turned Iona Peake’s incubator into a pink carriage adorned with silver wheels and sparkles while her colleagues hung princess and unicorn bunting. Princess Peake bunting was also made and hung above Iona and her carriage. There was also lightbox and signs for Princess Iona’s naming ceremony on Monday (August 6) and the hospital chairs were covered with pink blankets to tie in with the theme. Staff on the unit – including nurses, doctors, domestics and the receptionists – wore tiaras and carried wands for the ceremony and some came in on their days off to be part of the celebration. Iona was born nine months ago and has spent all of that time in hospital, her parents felt she deserved to be treated like a princess for the day and set the team the challenge to help them do that. “Iona has never really had a celebration to mark her birth and we wanted to have that with one day where it did not feel so much like we were in hospital,” mum Sharon said. “I wanted it to be girly and for Iona to be a princess for the day. I set one of the nurses the challenge and they were all amazing and gave us a proper girly, princess party. Nurses on the unit read poems and shared messages and other parents on the unit who have become friends with the family joined the celebrations. Dad, Mark, said: “It was quite overwhelming really that just about every member of staff came into the room or was queueing outside, it was really special.